‘What the Fun’ campaign for Aprilia SR 150 announced | IAMABIKER - Everything Motorcycle! 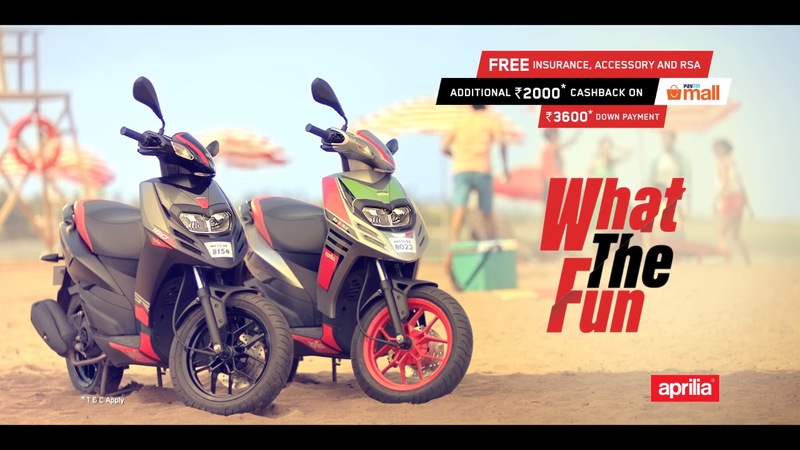 Aprilia launches their new marketing campaign – ‘What the Fun’, for their sporty bike Aprilia SR 150. Targeting all Aprilia enthusiasts, the campaign has been rolled out across print, outdoor, television and social media platforms representing the brand’s philosophy of Designed for Racers, Built for Riders. With the SR 150, Aprilia has extended its brand DNA to riders on the city roads. The new campaign reflects the light-hearted mood and moments that are experienced when having a great time: the fun that one is experiencing, the way you feel when riding the Aprilia, that is Designed For Racers, Built For Riders. After all, no matter the situation, it is the unexpected twists that turn moments into memories. The sensation of experiencing superior Racing Technology and taking Fun to the next level is “What The Fun” with the brand Aprilia. A new TV commercial unveiled as a part of the campaign showcases the spontaneous elements depicting fun activities merged into everyday moments of Aprilia Riders. With cosy colours and upbeat music, the commercial opens with girls playing beach volleyball. When a miscalculated shot bounces the volleyball out of the court towards two young boys on their Aprilia bikes, one of the girl’s gestures for the ball to be thrown back and that’s when the two boys get an instant idea to participate in the game. The boys look at each other and spontaneously decide to ride onto the court with their Aprilia bikes. An exciting volleyball game ensues with the girls and the guys playing on either side of the court, hitting the volleyball with their bikes, while constantly being on the move, leading to a lot of “what the fun” moments. The TVC closes capturing the fun moments, the high fives and the cheekiness of the attitude of the riders. The ad also captures the bike from the various angles depicting product USPs and ends with two Aprilia parked on the beach while the girls and boys having a good time chatting on the beach.